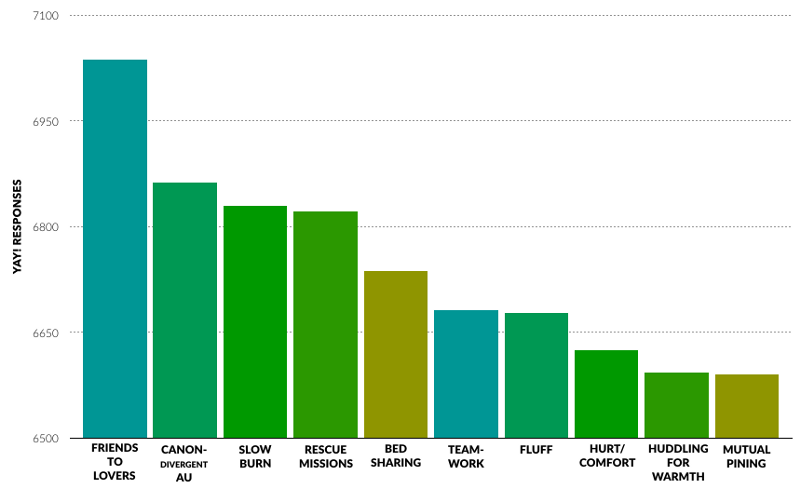 What are fans’ favorite fic tropes? We discuss the survey in Episode 34. We published a detailed summary of the results, and we also wrote about what tropes weren’t included. See what questions we asked and download the full results (warning: large spreadsheet), shared under a CC-BY 2.0 license. How do you define “fanfiction”? What counts as fic—and what doesn’t? We discuss the survey in Episode 46 and the results in Episode 49. Flourish wrote an article analyzing some of the results. You can also download the full results or the coded data set for the question “Please define fanfiction”; both are shared under a CC-BY 2.0 license. Do you use the term “alpha reader”? How do you find good fanfic? 100% complete canonical knowledge of a story-world vs. the power to veto a plot point in the next installment? How do you say fandom words in languages other than English? Can you be in more than one fandom at once? How many fandoms are you currently in? What does being ”in” a fandom mean to you? What little things make you feel immersed in your favorite worlds / do you stealth cosplay?